While the current news cycle fixates on a dying old man, it is good to be reminded of what Nelson Mandela did for us. Some of those reminders are in the objects he left behind. One of these artifacts I saw last year, here is the post. Writing those first drafts of history is a cliché lumped on us journalists. But this here is a real first draft of history. Nelson Mandela’s scrawl, notes jotted in an exercise book. A speech imperfect in its scratched out words, perhaps written on the fly. 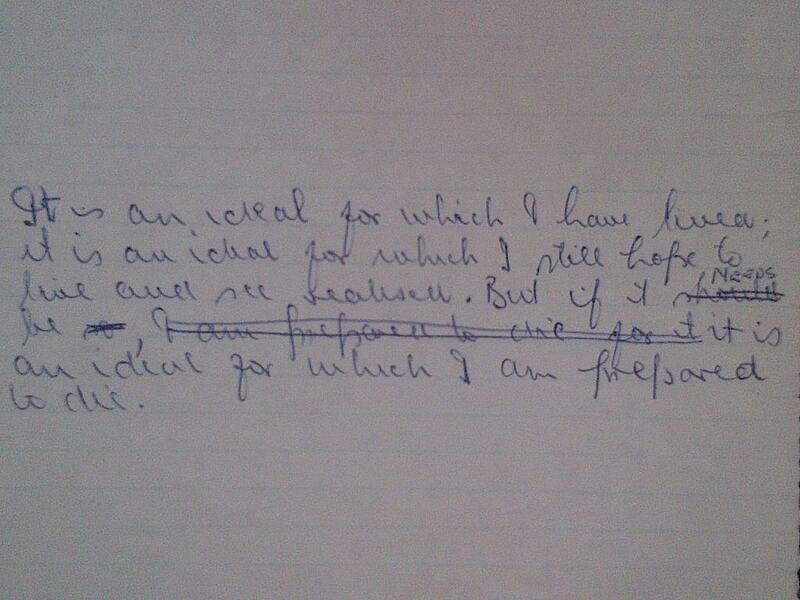 A first draft that was to change when Mandela gave it voice from the dock on April 20, 1964. The final two sentences of a famous speech. That was the first day of the opening of the defence case in the Rivonia Trial. A world changing speech seen in its raw form, before it was cleaned up and eagle eyed by a lawyer. The nucleus of an idea already there. This is a piece of history, that now sits in the Wits Art Museum, in Braamfontein and is part of a display of 90 artefacts to celebrate 90 years of the university. Nice to witness.